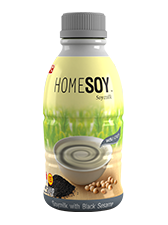 Homesoy with Black Sesame is naturally blended with no artificial additives or preservatives. It is low in cholesterol and uses pure soy with no mix of skim milk. Together with a traditional homemade formula UFC Homesoy uses quality soy beans from Canada and specially picked black sesame seeds to ensure the highest quality and finest fragrance and taste. Home soy Black Sesame blend is available in 300ml bottle with a simple 3 step procedure ‘twist’, ‘poke’ and ‘turn’ the cap to experience the traditional and tasty Homesoy.